This blog will discuss a sensitive topic that some people avoid talking about and most cannot swallow it. 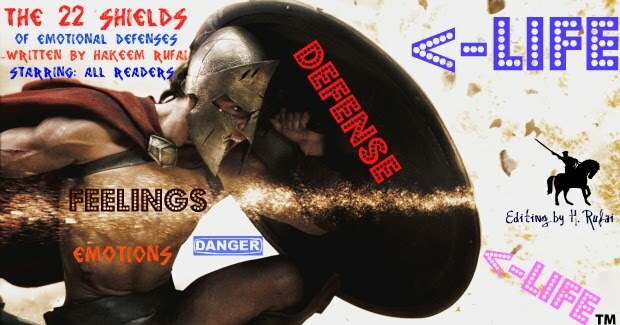 This topic is about EMOTIONAL DEFENSES. To give a little insight about what these are, emotional defenses are the behaviors that help us (all humans) survive certain situations which may make us feel scared, nervous, defenseless, inadequate, and offended or situations that we have a hard time coping with. Funny enough, when used EFFECTIVELY (which at least about 80% of US are not naturally that skilled in doing); emotional defenses actually help us adapt or cope to complex situations (i.e. stressful times, etc). So why do we feel defensive? We feel defensive when we get hurt. Sometimes we feel defensive before we get hurt, in which case we're simply guessing we're about to get hurt. Many times these guesses are wrong or based on a situation that is no longer true. For example: if, as a child, we were picked on for having a certain trait or mocked by an older sibling for being different from them, we might grow to develop sensitivity to whatever issue might have caused us to suffer in the past. Emotions have a purpose, a very good reason to be - even those emotions that feel uncomfortable. Fear is a warning; anger is for protection, tears are for cleansing and releasing. These are not negative emotional responses! We were taught to react negatively to them. It is our reaction that is dysfunctional and negative, not the emotion (Burney, R., 2006). So now you wonder; if emotional defenses are effective and necessary to cope, why or how can they be a bad thing? As I stated above, emotional defenses are not properly managed by most people because we use them too QUICKLY, TOO OFTEN, or very inappropriately which in turn will confuse our own minds, create a DISTORTED reality and HANDICAPP us from positively coping with the situation(s) at hand. Which all equals….A HOT MESS! Inappropriate, too fast or overused emotional defenses will lead to more stress, poor judgments being made, detachment from the situation and reduced effectiveness in even solving the situation at hand. When used appropriately, emotional defenses will reduce your stress, promote POSITIVE thinking, help you make the best decision/action after thinking and will help you become more mentally strong for the current and future situations. And this is all personal effectiveness, I’m sure we all know how inappropriate use of emotional defenses can effect OTHERS involved in any given situation….makes things about 20x more extreme/worse. 1. AGRESSION (physical, verbal or being passive): This is for those who defend using some form of aggression. When stress or problems approach, one of your reactions consist of, physically attacking something or someone, becoming verbally aggressive by screaming, swearing or attempting to belittle someone. Passive aggressive aggression is the hidden but also deadly one Passive aggressive behavior stems from an inability to express anger in a healthy way. (Burney, R., 2006). A person's feelings may be so repressed that they don't even realize they are angry or feeling resentment. 2. Drink alcohol or use drugs: This type of defense involves a person resorting to a mood altering substance to “help” them cope with the situation. Commonly observed amongst peers, in reaction to a rough scenario you feel like you “need a drink” to help soothe your emotions. Then the next day, you need a drink, then the next weekend, same stress there, you need more drinks, and more drinks to escape from your reality. Same with using drugs to “take you away from the pain”. 3. Clown: With this defense, the person uses a lot of jokes or humor in an attempt to cope with the situation at hand. Serious topics become humorous with hopes to hide or deflect their true feelings. The REAL emotions that you don’t want to show or don’t know how to express; humor will be an appropriate “fill-in” to make you feel better. 4. Blame: Ahh the infamous blame game. This defense involves a person often BLAMING someone else for a bad situation or event. The person becomes so absorbed in blaming others for their stress in a subconscious attempt to detach from the issue at hand and transfer all “error or wrong doing” onto another person/place or thing. It is easier to remove all sense of contribution to a problem and blame something else than to take partial responsibility for the situation at hand. 5. Cry-a-lot: this defense involves becoming oversensitive when faced with stress or problems. It is healthy to cry but you cry more than the average, burst out in random tears and cry all of most of the day. Crying becomes your primary action, led by sadness or sorrow as the emotions associated with it. The more you cry, the worse you feel and the less time spent utilizing other emotions or actions to help the situation. To most, crying will feel like “an uncontrollable urge”. 6. OverEat or NOT eat: this is self explanatory. When stressed or in a problematic situation this person resorts to eating more often to compensate or escape from the situation or they barely/rarely eat due to the lack of natural pleasure when consuming food. You spend more time thinking about food than the actual “situation” or you spend too much time thinking about the “situation” feeling helpless that you almost completely abandon the desire to eat food without even knowing it. Hence the reason sometimes you can find someone saying “I was so stressed that I lost/gained so much weight”. 7. WORK-A-Holic: this defense is characterized by becoming troubled with a situation/event and the defense becomes “simple” to them without even realizing it. Instead of effectively facing the problem…..just work more hours! Make more money, stay out later and “keep your mind clear for longer”, every day, every week keep postponing the inevitable with the reason of making more money, “taking care of things at the work place”. 9. Become “Too Busy”: This defense involves a person becoming very occupied with everything when faced with stress or conflict. This is different from the Work-A-Holic defense because subconsciously, the person feels the need to be involved in many things at once: drive here, drive there, help this person with this or that, laundry, clean, run pointless errands, etc. Or whatever you feel is relevant to do at the time because the mentality becomes “there is ALWAYS” something to be done around the house, at work, online, outside or anywhere that comes to mind. In your head, you are “taking care of important business” to everyone else, you are missing in action. End result = the same issues or stress remains, just prolonged exposure to unresolved issues in the back of your mind. All subconscious. 10. Read-a-lot – this defense is self explanatory. / When faced with stress or conflict, the person will resort to reading a lot. The desire to read more magazines or books will overshadow their reality and how they are taking care of their situation. Reading will serve as “something to do” keeping your mind off of unpleasant worries and helping you escape your own reality by diving into “another reality” and reading will consume most of your time while the actual ISSUE gets less of your mental energy. 11. OverSleep or UnderSleep: This defense involves what it says. To escape your stress or conflict, the person will start to sleep more than usual, take more naps for longer periods and may often feel TIRED if they oversleep because too much sleep = a sluggish body and mind. Those who under sleep may just lose the desire to sleep because of stress, anxiety, worrying, etc. The pleasure associated “sleeping to rejuvenate” is no longer registered by your mind/body. In BOTH defenses, you will become tired, emotionally, mentally and physically, more and more without even realizing it. 12. Media-for-me: This defense gives the person the urge to Engulf yourself in watching MUCH MORE TV ,listening to more music or playing more video games to avoid or delay confronting a stressful event/person. Video game characters, Musicians and TV characters become their sanctity. 14. Denial: This defense involves the refusal to accept something as reality. It is an unconscious attempt to protect oneself from something that is hurtful and/or difficult to accept. Denial may not necessarily be done with a malicious in intent. Denial is not the same as lying. Lying is a deliberate attempt to deceive with an untrue statement. 15. Pleaser/Placate: in this defense the person does anything to please others when faced with stress or conflict. They often just figure “it doesn’t matter, you are right and I was wrong” to make the situation “better” but are not able to see how this makes the situation worse. They placate, agree with the opposing party about a certain behavior and often agree to change something but nothing gets changed. This defense is better known as “going with the flow to make things blow over” but at the expense of agreeing with things they may not necessarily agree or believe so the problems will come back at a future date, OR it will lead to a feeling of RESENTMENT which is DEADLY. They may feel “you can never win with ____” so they just agree to shut them up while building internal anger/hatred and disgust for the person and their attitude. 16. Co-Dependant: Codependence is characterized by dependence on outer or external sources for self-worth and self-definition. This outer or external dependence, combined with unhealed childhood emotional wounds which get reactivated/gouged whenever an emotional "button" is pushed causes the Codependent person to live life in reaction to or give power over self-esteem to outside sources aka OTHER PEOPLE (Burney, R. 2009). Codependence is all about giving outside or external influences power over our self-esteem. Everything outside of our 'self'-> that is people, places and things or our own external appearance has to do with ego-strength….not self-worth. 17. Minimize: This defense involves lowering the degree/seriousness of the situation at hand, or a lessening of the impact or value of an act, prospect, or influence in order to make it appear LESS IMPORTANT THAN IT REALLY IS. This generally happens if the person does not “understand” how the situation effects others or they refuse to believe that other people SHOULD feel a certain way because “it’s not that serious”. 18. Shopping – This defense involves the person having the increased desire to shop and spend money when faced with stress or conflict. The endorphins released when shopping may be the only feeling of PLEASURE the person can experience due to stress, anxiety, etc. Shoppers experience the same rush of endorphins when they stumble across a hot sale promotion as they do when they are sexually aroused so it is easy to understand why some may resort to shopping as a defense/escape but this behavior can result in spending pointless money, and adding financial stress to their own situation without recognizing when to stop shopping. 20. Talk-A-Lot – In this defense, the person tends to become very talkative when confronted with a stressful situation or event. The person starts to compensate for stress/anxiety by talking and talking and talking, may be characterized as “rambling on”. In this state, the act of talking will feel like a temporary relief to see that people are listening or engaged with that the person has to say, whether relevant or irrelevant to the topic. Example may be when you encounter a stranger at the grocery store and they continue to talk on and on. The talking may eventually lead to them saying the issue that is causing them stress somewhere in the mix. They may go into depth, or just mention it and continue to talk about “Other” topics to feel better. 21. Self-Harm – In this defense, the person will resort to self mutilating behavior at times of stress/anxiety/anger. This includes, self-cutting (wrist, legs) -> Causing physical pain to themselves to “feel better”. For a person who self mutilates, the pain serves as a “stress reliever”, if they cannot control the situation, they can control which times they relieve some tension (self harm). This is a very dangerous emotional defense; cutting can lead to bleeding to death and/or severe internal damage via infections. 22. The GREAT PRETENDER – In this defense, the person starts to subconsciously create something like a “dream world” or “alternate reality” in their mind. It starts as a simple denial or fabrication of a situation “I make THIS much money per year” “I will NEVER do……” “I don’t know WHAT you are talking about, you got me all wrong if you think that about me” but in REALITY….what they are saying is FALSE or not entirely true. When a person feels scared, nervous, inadequate, overly anxious to reach a goal or “not happy with their situation” then an alternate reality starts to become primary when they are in the public eye. Basically, the person is trying to HIDE how things really are in their personal lives by any means necessary. After a while please NOTE, it does not become “just a lie” to them so they often deny “lying” until the death of them. The persona they have formed in their minds about how life SHOULD be, becomes how life REALLY is to them and how life REALLY is becomes something like a bad dream to them “this is just temporary, I need to get back on track….this just isn’t me, I’m better than this”. Ever heard a scenario or met a person who boasts about themselves on various topics but….you don’t see any of this to be “true” the more you know them. Seems like they are living a double life? That is because they just might be. One person with one brain but two split perceptions of what is real and what they want to be real. Depending on the length of time this has been going on, the perception of what they “wish” for will be dominant when describing themselves to others, their lives will be described with PLENTY of happiness, success, money, 100% drama-free and 0% faults or blame. They are managing their situation just fine. When confronting a stressful event involving others, many people AVOID using primary feeling words. There are only a handful of primary feelings that all humans feel. There is some dispute about just how many are primary but for our purpose here I am going to use seven. Those are: angry/mad, sad, hurt, afraid/scared, lonely, ashamed, and happy/glad. It is important to start using the primary names of these feelings in order to own them and to stop distancing ourselves from the feelings. To say "I am anxious" or "concerned" or "apprehensive" is not the same as saying "I feel afraid." Fear is at the root of all of those expressions but we don't have to be so in touch with our fear if we use a word that distances us from the fear. Expressions like "confused," "irritated," "upset," "tense," "disturbed," "blue," "good," or "bad" are not primary feeling words (Burney, R., 2004, Common Emotional Defenses). We were trained to be emotionally dishonest in childhood. In order to start peeling the layers of denial it is important to get aware of our OWN emotional defenses. In order to start getting emotionally honest with ourselves - let alone with anyone else - it is vital to start recognizing our own emotional defenses. The little tricks of language and focus that we learned to help us distance ourselves from feelings that we did not know how to deal with. Becoming willing to get conscious of our own defenses is a vital step to getting in touch with our own feelings. Learning to be emotionally honest with our self is an important part of a recovery/healing path. Taking action is one of the most valuable tools in the recovery process and is very much connected to the principle of taking responsibility. It is very important to become proactive in our own healing process. That means that we need to align our will and our will power with healing instead of with the disease. (Burney, R., 2004). In our disease we were reacting to life out of a dysfunctional belief system. We were playing the game of life according to a set of rules that do not work to bring us happiness, serenity, and fulfillment. There is no happily ever after on this plane, in these bodies. The goal is not to do life "right" in order to reach a destination. True success is achieved by learning, growing, and enjoying the journey - not by reaching a specific destination (Burney, R., 2004). The faster you identify your FAULTS/contribution to your situations, the better it will be for your mentally and the others around you. You can comment with your emotional defenses, to say thanks…etc but my MAIN goal is to HOPEFULLY have educated readers and provided better insight on emotional defenses and identifying them. This is grea! Thank you so much.